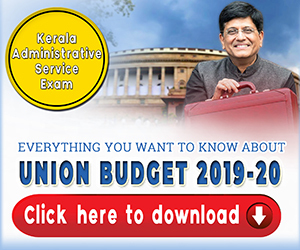 The Interim Union Budget 2019-20 was presented in Parliament on February 1, 2019 by the Union Minister for Finance, Corporate Affairs, Railways & Coal, Shri Piyush Goyal. It was the sixth and final budget of NDA Government. An Interim Budget is presented by a government in the final year of its tenure. When it’s an outgoing government or the case where the government doesn’t have time to present the full budget because the elections are approaching, it presents an interim budget which later can be approved finally by the incoming government. A key point of difference between Interim Budget and a full-fledged Union Budget is that the former is only valid for two months while the latter is for a whole year. The interim budget 2019-20 presented contained elements that are aimed at benefiting three major segments of the population – farmers, informal sector workers and salaried taxpayers. 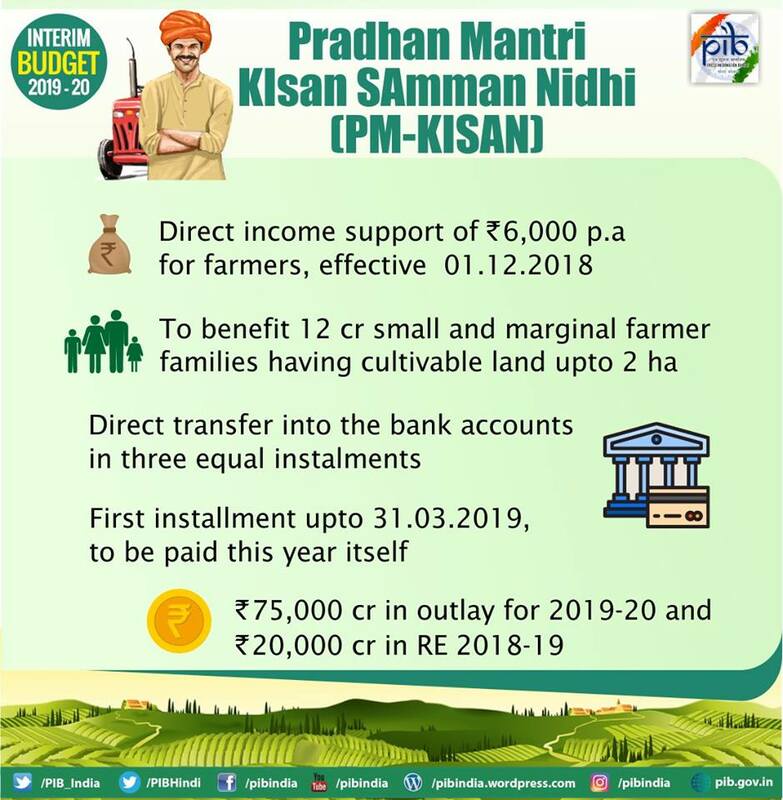 A new scheme Pradhan Mantri Kisan Samman Nidhi (PM-KISAN) was announced to provide an assured income support to the small and marginal farmers. The scheme aims to extend direct income support at the rate of Rs. 6,000 per year to farmer families, having cultivable land upto 2 hectares. The farmers who own less than one hectare of land are marginal and those who own between 1 and 2 hectares of land are small. Around 12.56 crore small and marginal farmer families are expected to benefit from this. Kerala has most such farmers and Punjab the least. This programme will entail an annual expenditure of Rs. 75,000 crore in 2019-20. In addition to this Rs. 20000 crore has been allocated for the current financial year. The programme would be made effective from 1st December 2018 and the first installment for the period up to 31st March 2019 would be paid during this year itself. A pension scheme Pradhan Mantri Shram-Yogi Maandhan was announced for the unorganised sector workers with monthly income upto Rs 15,000. Under this scheme, subscribers will receive an assured monthly pension of ₹3,000 per month from the age of 60 onwards. 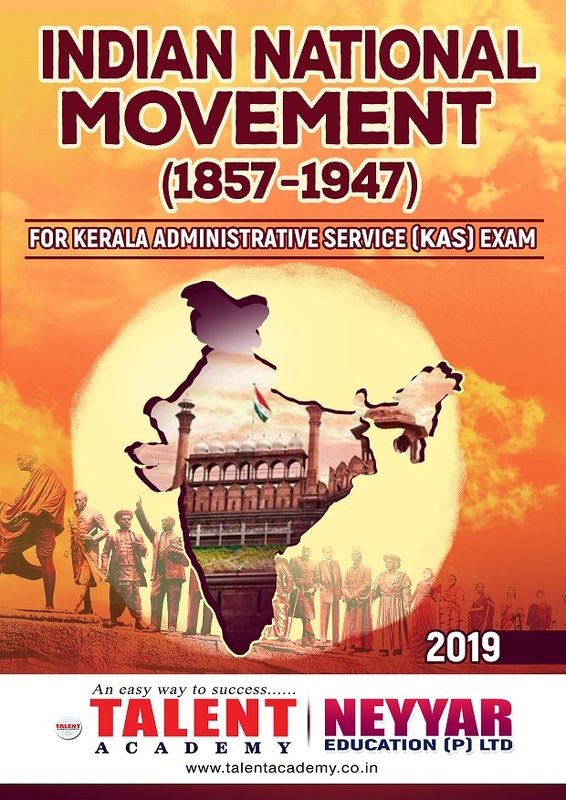 Towards this, they will have to contribute ₹55 a month (if they join at the age of 18 years), or ₹100 a month (if they join at the age of 29 years). 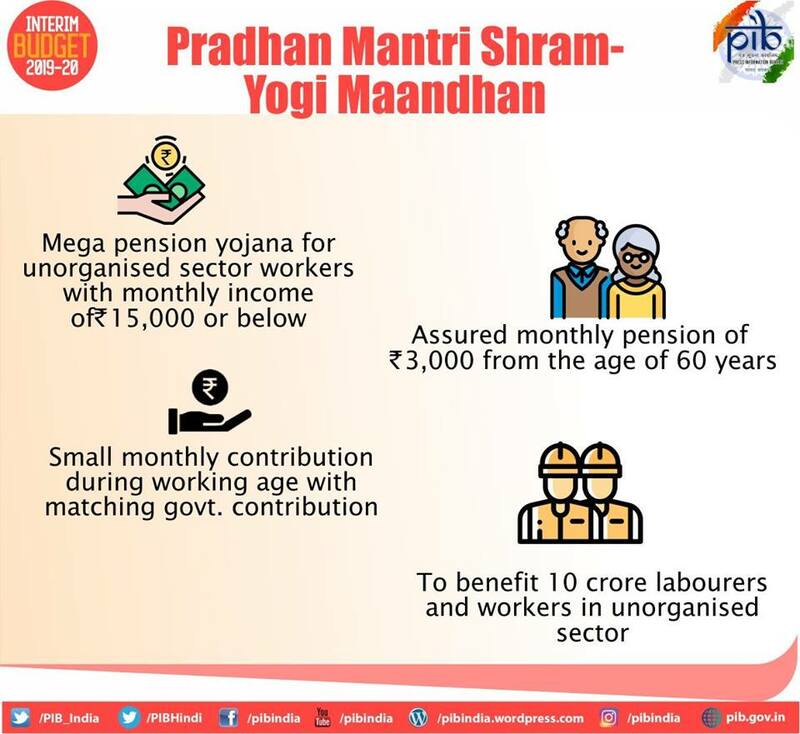 It is expected that at least 10 crore labourers and workers in the unorganised sector will avail the benefit of ‘Pradhan Mantri Shram-Yogi Maandhan’ within next five years making it one of the largest pension schemes of the world. A sum of Rs. 500 crore has been allocated for the scheme. The scheme will also be implemented from the current year. The interim budget contains several proposals aimed at reducing tax burden. Individual taxpayers with annual income up to Rs. 5 lakh will not have to pay any income tax (earlier it was 2.5 lakhs). Individuals with gross income of up to Rs. 6.5 lakh would not have to pay any tax if they make investments in provident funds, specified savings, insurance and other prescribed methods. Finance Minister during his Budget Speed said the government had approved a path-breaking, technology-intensive project to transform the Income Tax Department into a more user-friendly one. All returns will be processed in 24 hours and refunds issued simultaneously. Within the next two years, almost all verification and assessment of returns will be done electronically through anonymised back office, manned by tax experts and officials, without any personal interface between taxpayers and tax officers. The Finance Minister informed the Parliament that the tax collections increased significantly from Rs. 6.38 Lakh crore in 2013-14 to almost Rs. 12 lakh crore in 2017-18. The number of returns filed have also increased from 3.79 crore to 6.85 crore showing 80% growth in tax base. The total direct tax collection is estimated to be over ₹10 lakh crore in 2017-18, an increase of about 18% from the previous year. About 1.06 crore people have been included in the tax base. As per current laws, if the taxpayer owns more than one house property for personal use the rest of the properties are considered to be on rent and income tax levied on a notional rental value. 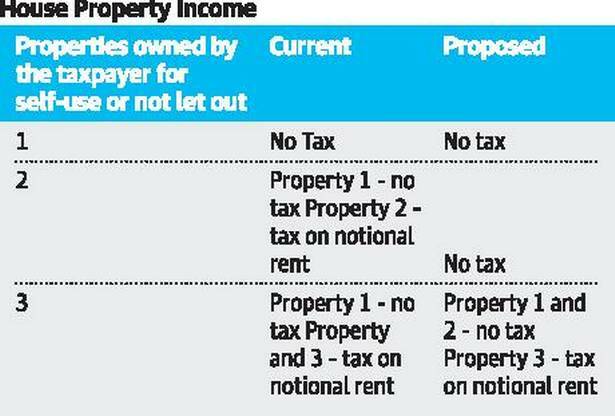 The new budget proposed to exempt the notional rent of second self-occupied house from tax. This move will give relief to the middle class having to maintain families at two locations on account of their job, children’s education, care of parents, etc. Standard Deduction is a flat amount subtracted from the annual salary income, and is fixed by the government. 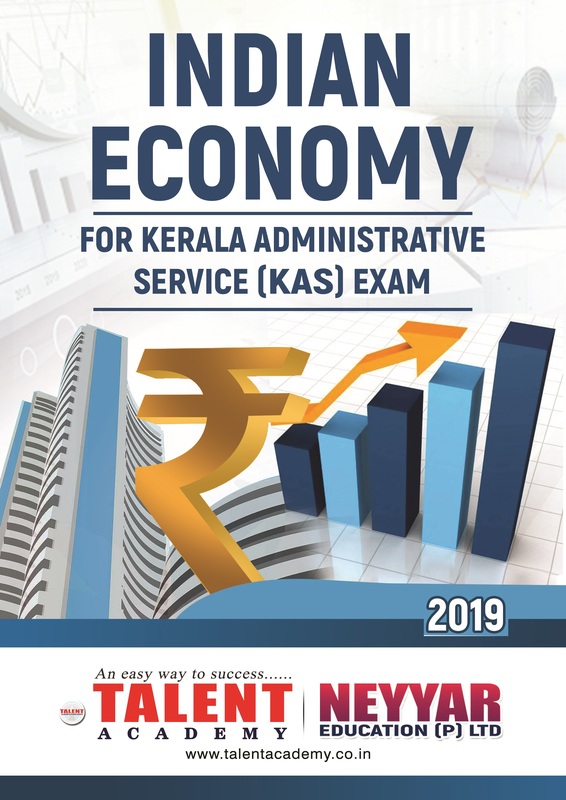 Since a fixed amount is deducted from the annual salary, it reduces the taxable income, and hence the tax paid amount will also reduce. A Salaried employee and a pensioner can claim Standard Deduction. Standard deduction allowed the salaried class to take care of expenses that didn’t come under the purview of the income tax rules. In the new Budget, Standard Deduction has been raised from the current Rs. 40,000 to Rs. 50,000. This will provide additional tax benefit of Rs. 4,700 crore to more than 3 crore salary earners and pensioners. Other than some income tax rules, the government have also announced changes to the rules on TDS (Tax Deducted at Source). TDS or Tax Deducted at Source is a direct tax paid to the government under certain conditions. Deduced by the payer, TDS is aimed at collection of tax from the very source of income. The interim budget for 2019-20 proposes to raise the threshold of TDS applicable to interest income from bank or post office deposits by four times. As per existing rules, TDS is applicable on interest income above Rs. 10,000 from post office/bank deposits. 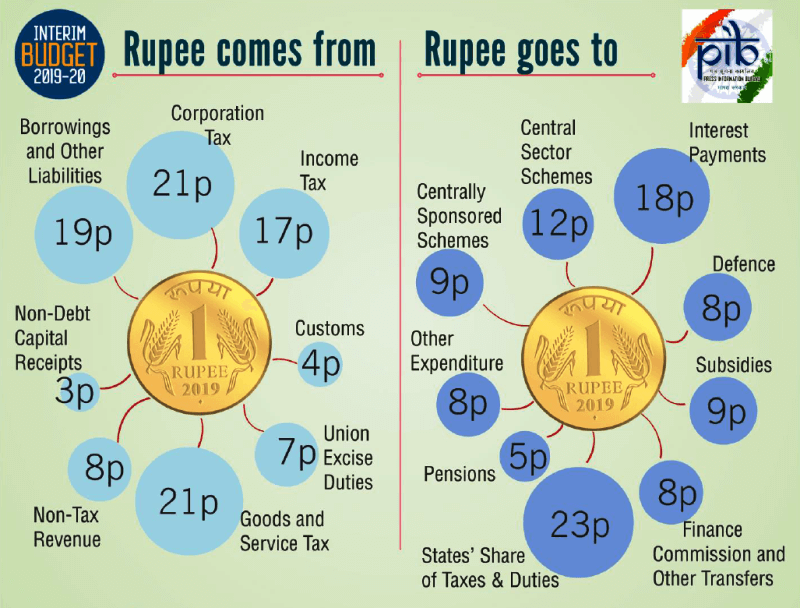 The Budget 2019 proposes to change this threshold to Rs. 40,000. This means that TDS won’t be applicable to such interest income up to Rs. 40,000, instead of Rs. 10,000 at present. Further, the TDS threshold for deduction of tax on rent is proposed to be increased from Rs. 1,80,000 to Rs. 2,40,000 for providing relief to small taxpayers. As per existing rules, TDS is applicable on payment of rent above Rs. 1.8 lakh. In other words, payment of rent above 1.8 lakh attracts TDS at present. The capital gains tax is a tax levied on profits from the sale of assets such as stocks, bonds, precious metals, and property. Under the current law (Section 54 of the Income Tax Act), the seller of a residential property is not required to pay capital gains tax, if the money from the sale was used to acquire another residential property. The government decided to extend this benefit of rollover of capital gains from one residential house to two residential houses for a tax payer having capital gains up to Rs. 2 crore. This benefit can be availed once in a life time. The Government has decided to create a separate Department of Fisheries with an aim to provide sustained and focused attention towards development of fisheries sector. Government announced the formation of Rashtriya Kamdhenu Aayog (National Cow Board) to look after the welfare of cows and boost diary production. The government will allocate Rs. 750 crore for this purpose from current year itself. A Committee under NITI Aayog will be set up to complete the task of identifying De-notified, Nomadic and Semi-nomadic communities not yet formally classified. These communities are hard to reach, less visible, and therefore, frequently left out. The Nomadic and Semi-Nomadic communities move from place to place in search of a livelihood. The Government will also set up a Welfare Development Board under the Ministry of Social Justice and Empowerment specifically for the purpose of implementing welfare and development programmes for De-notified, Nomadic and Semi-Nomadic communities. A ‘National Programme on Artificial Intelligence’ was announced in the Budget. This tie into an existing programme led by the Union Science Ministry called the National Mission on Interdisciplinary Cyber-Physical Systems (NM-ICPS). The latter was cleared by the Union Cabinet last December at a total outlay of ₹3,660 crore for five years. The Defence Sector was allocated Rs. 3.18 lakh crore in the interim Budget. The Finance Minister announced that for the first time, the country’s Defence Budget will be of over Rs.3 lakh crore. It represents a 7.92% growth over the last year’s allocation. Besides this, Rs. 1.12 lakh crore was allocated for pensions in defence sector. The total allocation including Defence pensions forms 15.48 % of the total Central government expenditure for the year 2019-20. The Home ministry has been allocated over Rs. One Lakh crore for the next fiscal year, with special emphasis on boarder infrastructure of the para military forces. The Railways’ overall capital expenditure programme in 2019-20 is of Rs. 1,58,658 crore. The capital support from Budget for railways is proposed at Rs. 64,587 Crore. The government on February 1 increased the disinvestment target to Rs. 90,000 crore for the financial year 2019-20, from Rs. 80,000 crore in 2018-19 (up by 12.5 percent). Many economists also expressed concerns over the disinvestment target, since the government has raised only about Rs. 36,000 crore in 2018-19 against a target of 80,000 crore. A single window clearance for Indian filmmakers and anti-camcorder regulations will be introduced in Indian Cinematograph Act to prevent piracy. The Finance Minister Piyush Goyal while presenting Budget 2019-20 laid out the government’s 10 point vision to be achieved by 2030. Clean Rivers: Go beyond the Ganga to include all rivers and ensure safe drinking water for all Indians. 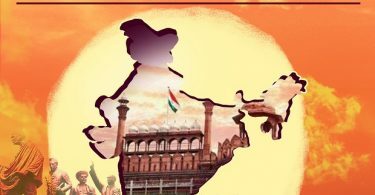 Minimum government, maximum governance: A proactive and responsible bureaucracy which will be viewed as friendly to people. The total expenditure expected in the Interim Budget 2019-20 is of 27.84 lakh crore rupees. The expenditure has increased significantly when compared with the Union Budget 2018-19, where the expenditure figure was 24.42 lakh crore rupees. The total revenue expected in the financial year 2019-20 (without considering borrowing) is only Rs. 20.80 lakh crores. This is a deficit Budget, as the expenditure is way higher than the receipts. To balance the expenditure and receipts side of the budget, the government needs to borrow money. The difference between total revenue and total expenditure of the government is termed as fiscal deficit. Fiscal Deficit represents the total borrowing requirements of Government. The Indian government needs to borrow Rs. 7.04 lakh crore in the financial year 2019-20 to meet its expenditure. As per budget 2019, Fiscal Deficit is 3.4% of Indian GDP. The government had earlier set a fiscal deficit target of 3.3% for 2018-19 and 3.1% for 2019-20. The new Budget pegs the fiscal deficit of year 2019-20 at 3.4% of GDP, which is 0.3% higher than the target. The Finance Minister said that if the farmers’ scheme allocation was to be excluded, the fiscal deficit would have been less than 3.3% for 2018-19 and less than 3.1% for year 2019-20. The estimated slippage in fiscal deficit point is not significant if we assume that the concessions will spur spending by the beneficiaries. This is, of course, assuming that the gross tax revenue projection of ₹25.52 lakh crore, which is a 13.5% growth over the revised estimates of 2018-19, is achieved. Revenue Receipts: Revenue receipts are those receipts which neither create any liability (means don’t have to pay back the money) nor cause any reduction in the assets (means money not raised by selling assets) of the government. They are recurring in nature. 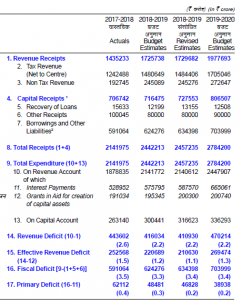 Revenue receipts consist of tax revenues and non-tax revenues. Tax revenues comprise proceeds of taxes and other duties levied. Non-tax revenue includes interest receipts (received on loans given by the government to states, railways and others), dividends and profits received from public sector companies, fees and charges for various government services etc. Revenue Expenditure: The expenditure incurred for normal running of government functionaries, which otherwise does not result in creation of assets is called revenue expenditure. Salary, pension, subsidies, grants to states and Union Territories etc. come under this. Capital Receipts: Capital receipts are those receipts which either create a liability (means money has to be paid back) or cause a reduction in the assets of the government. Loans taken from foreign countries and domestic market come under this. Capital Expenditure: This refers to that expenditure which creates permanent assets (e.g. school building) and or cause reduction in the liabilities of the government (eg. Paying back the loan taken). Fiscal Deficit: Fiscal deficit refers to the excess of total expenditure over total receipts excluding borrowings. Effective Revenue Deficit: It is the difference between Revenue Deficit and Grants for Creation of Capital Assets. 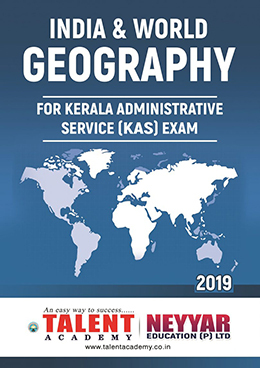 There are several grants which the Union Government give to the states and Union Territories, and some of which do create new assets. The grants for such expenditure will not strictly fall in revenue expenditure. This has to be excluded from Revenue Deficit. Primary Deficit: It is measured as Fiscal Deficit minus interest payments.